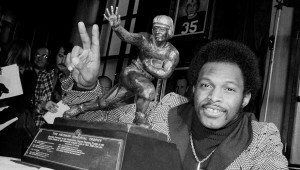 The December Sports Then and Now Vintage Athlete of the Month is the only football player ever to capture college football’s top individual award twice. Freshman Johnny Manziel claimed the 2012 Heisman Trophy. The selection of Texas A&M freshman quarterback Johnny Manziel as the 2012 Heisman Trophy winner showed us quite a lot about the evolution of college football. Freshman Rising – Some may not realize that it was just 40 years ago when freshmen were first allowed to compete on varsity teams. Prior to that, all freshmen competed on what were then known as “freshmen teams” to get accustomed to college life and college athletics. They then had three years of varsity eligibility. Of course, once freshmen were given varsity eligibility in 1972 it started the trend of “redshirting” which has some of the same benefits of the old system in allowing the new student-athlete to get accustomed to college, but does not include the freshman team competition that utilized a year of eligibility. Johnny Manziel is a beneficiary of the redshirt program as he did not walk right off a high school campus this past spring and suddenly develop into the Heisman Trophy winner. Instead, he had a year of seasoning at Texas A&M before being thrust into the spotlight.